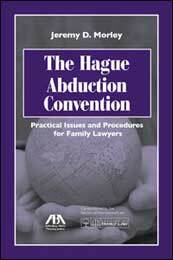 Here are some tips from attorney Jeremy D. Morley -- who has worked on hundreds of Hague cases and is the author of the American Bar Association treatise on The Hague Abduction Convention -- for attorneys and clients faced with instituting or defending child abduction proceedings under the Hague Convention on the Civil Aspects of International Child Abduction in the United States. In a nutshell, a Hague Convention application may be made when a child is taken or retained across an international border, away from his or her habitual residence, without the consent of a parent who has rights of custody under the law of the habitual residence, if the two countries are parties to the Convention. The child must be promptly returned to the habitual residence unless the return will create a grave risk of harm to the child or another limited exception is established. An attorney must be ready to file a Hague Convention application and institute or defend a Hague Convention lawsuit on extremely short notice. Prompt action may be critical. The Convention specifically requires that hearings be conducted expeditiously. Indeed, it is recommended that Hague cases should be completely concluded within six weeks. A Hague case can theoretically be instituted more than a year after the abduction but a defense (or, more precisely, an exception) will then arise if the child has become settled in the new environment. In practice, the longer a child is in a new place the more likely it is that a court will be reluctant to send the child away. Fast action by the left-behind parent is also necessary to help prevent a claim that the parent has acquiesced in the child's relocation, and to help to bolster a claim that the left-behind parent consented to the taking or retention in the first place. Clients must move quickly to obtain the documents needed to file the initial application and then to collect the documents needed for the hearing. They should normally be asked to prepare a detailed family history and to assist the attorney to develop evidence as rapidly as possible. Counsel should consider putting the abducting parent on immediate written and formal notice of the dire consequences, civil, criminal and financial, that the abduction will cause to that parent personally, and, possibly to others conspiring with the parent. It may be appropriate to provide an extremely short time for the abducting parent to cure the problem by returning the child. On the other hand, such notice might be counter-productive if there is a suspicion that the taking parent might hide the child. Counsel must decide quickly whether to bring suit in state or federal court. The International Child Abduction Remedies Act provides for concurrent jurisdiction. If a state court is chosen, the respondent has the absolute right to remove the case to the federal court. Choosing the right court can make all the difference in a Hague case. Counsel might enlist the support of the U.S. State Department's Office of Children's Issues. Such support may be particularly helpful to locate the child. It might also be useful if the left-behind parent seeks a U.S. visa to enter the United States in order to attend the trial. Counsel might also suggest that, if there is no custody order in place from a court in the jurisdiction of the habitual residence, the left-behind parent should perhaps institute civil proceedings in those courts for such an order (or perhaps for a modification of the original order). However, this should not be undertaken without U.S. counsel conferring with counsel in the other country. If a child has been abducted to the United States, proceeding under the Hague Convention might not be the best course of action. All U.S. states have adopted the Uniform Child Custody Jurisdiction & Enforcement Act (except Massachusetts which has adopted a prior uniform law). That Act provides remedies that may be far more useful – and far cheaper -- than those provided under the Hague Convention. You need a lawyer who understands the issues and who can put you on the right track. Hague cases in the United States can be brought in federal or state court. The completely different backgrounds of state family court judges and federal judges means that the choice of either the state system or the federal system might have a major impact on the outcome of the case. If a case is brought in a state court it may be removed to the federal court but only if that is accomplished quickly. The International Child Abduction Remedies Act expressly authorizes the state or federal court handling a Hague case to order “provisional remedies” to protect the well-being of the child involved or to prevent the child's further removal or concealment before the final disposition of the petition. Such an order should invariably be sought to keep the child in the jurisdiction pending the hearing of the Hague petition but a left-behind parent will also want to secure interim access to the child. Hague Convention cases are often extremely fact-intensive. They frequently hinge on the ability of one party to convince the court of matters such as the habitual residence of a child (which hinges in large part in most but not all circuits on the last shared intention of the parents); the nature of the left-behind parent's custody rights under the foreign law (which may require expert evidence as to the terms of the foreign law); the extent to which a parent actually exercised custody rights; whether or not a parent consented to or acquiesced in a new residency; whether such consent or acquiescence was conditional; whether the child has become well settled in the new environment; whether the child was physically or psychologically abused; whether the taking parent was abused in such a way that there was an impact on the child; whether the authorities in the foreign country provided adequate protection to the children and the taking parent in the past or could do so in the future; the age and maturity level of the child, whether and why the child objects to being returned. For a court to resolve these matters it must analyze the relevant facts. A successful Hague proceeding requires the attorney, working closely with the client, to marshal as much evidence as possible, in as many forms as possible, to support the client's position. Clients are frequently shocked that matters that to them are obvious and indisputable turn out to be disputed and to require them to produce clear and convincing proof. They may well be insulted that their word alone is insufficient to convince the court that they are truthful and that the other parent is lying. In one case, the parents had moved permanently with their young child from the mother's native country to the U.S. Two years later, the mother took the child back to her country for a vacation and then refused to return to the States. In supporting her claim that the child was never habitually resident in the States she claimed that the original move to America had been only temporary and that she and the father had agreed that they would return to the mother's native country after a year or two. The mother had planned the move well in advance and had amassed -- and even created -- evidence that tended to support her claims. Additionally, she had removed evidence from the parties' home that would have disproved her claims. To win the case, we interviewed neighbors, friends, family members, schoolteachers, real estate salespeople, fellow office workers and an array of other people who had had some connection with the family. We checked into any and all areas of the mother's life for anything that might indicate her intention to stay in the States. We obtained emails, notes, invoices, and other documents. We searched old household bills for evidence of the purchase of items that inferred a degree of permanency. At the hearing, the mother was shocked that her husband had collected so much written evidence to disprove her claims and undercut her credibility. The courts ultimately -- and with great reluctance, since they were going against a local national -- found in favor of our client. Since Hague cases are tried quickly, there is usually only one chance to present the case and it needs to be done well at the very outset. An attorney must embark on a quick campaign of collecting mounds of relevant evidence to support the client's positions, and must expect the other parent to lie, cheat, and distort the facts in a desperate attempt to avoid losing the case. Just as a current military strategy is to employ overwhelming force to create shock and awe, so too in a Hague Convention case it is often advisable to use overwhelming amounts of evidence to win the case. Such a campaign in a Hague proceeding may yield a capitulation by the other parent even before the hearing actually commences. Hague Convention hearings sometimes take the form of "he said, she said" disputes in which each side makes verbal accusations against the other. Documentary evidence is usually far better than the mere word of one parent. Thus, if you want to claim that a parent applied for an immigration visa, you must be prepared to do more than simply have the parent tell the court that this was done. You should do whatever you can to get hold of the actual application papers that the parent signed in applying for the visa, which may mean contacting the lawyer who handled the immigration matter originally. Emails and text messages can be invaluable sources of critical evidence, especially concerning the parents' intentions and agreements. While it is helpful if documents are supported by sworn statements, it is not essential. Both the Convention and the International Child Abduction Remedies Act provide that authentication of documents is not required in a Convention proceeding. Discovery is generally permitted in Hague cases but it must be balanced against the requirement that Hague cases should be concluded quickly. It is essential to decide at the outset of a case whether discovery is really needed because it should be requested at the time of the initial meeting with the court or otherwise it might be waived. Hague Convention cases raise unusual international law, foreign law and treaty law questions. They involve the courts in matters of a kind that they are usually not used to handling. In many jurisdictions the court may be entirely unfamiliar with Hague cases. Accordingly, it is usually essential for the lawyers to help the court to an unusual extent. Certainly, a well-reasoned memorandum of law is essential. The matters in dispute in most Hague cases raise difficult legal issues that must be thoroughly briefed. Thus, the Convention requires the left-behind parent to establish that the child was taken from the "habitual residence" and that the parent had "rights of custody" under the law of that jurisdiction. However, neither of those fundamental terms is defined in the Convention and substantial jurisprudence has grown domestically and internationally setting forth often-contradictory determinations concerning their scope and meaning. Courts have held that, while they must determine under international law whether the left-behind parent possesses Hague Convention "custody rights," they must first examine the law of the child's habitual residence in order to ascertain the extent of the rights that such parent possesses under that law. In this regard, it is often essential to use foreign law experts to establish the existence and scope of such rights. A Hague Convention attorney may, and often should, cite cases not only from the domestic jurisdiction but also from other jurisdictions if they support the client's position. It has become more usual to cite cases from other jurisdictions in this area of the law than perhaps in any other. Courts around the world recognize that it is best to coordinate their decisions with those of other courts internationally and, for that very reason, the Hague Conference on Private International Law has established a database of significant Hague cases from courts around the world. In representing the left-behind parent in a Hague proceeding, it is necessary to keep the court focused on the narrow issues that the Convention requires an applicant to establish and the narrow defenses that a respondent can assert. Whenever the hearing strays into any areas that might be considered as constituting an analysis of the child's best interests, the other party (usually the petitioner) should vehemently object. However, a party opposing a return should do his or her utmost to assert any and all relevant issues under the rubric of one of the defenses specified in the Convention and should be armed with case law to establish that similar claims were permitted in other cases. In Hague cases evidence rules are usually relaxed, so evidence should be submitted in any possible format. Live testimony is invariably the best and normally everything should be done to get the left-behind parent into the courtroom. (An exception is if that parent would be a poor witness and his or her presence would create an opportunity for embarrassing cross-examination). If a witness cannot be brought to the courthouse, consider testimony by video conferencing or otherwise by telephone conference. As a last resort, submit affidavits. Be aware, also, that there is a trend among some judges to require that the direct evidence of witnesses be provided in affidavit form and that only cross-examination and redirect testimony is allowed in live form. Hague Convention cases happen too fast, and too much is at stake for the client, for an attorney to learn about this area of law at the last minute. It is extremely important to locate counsel with knowledge and experience in Hague proceedings. It is also frequently valuable for a client whose child has been abducted to retain a lawyer in his or her home country who can coordinate with the Hague counsel in the country to which the child has been taken. Many experienced Hague lawyers will assist local lawyers in handling Hague cases, and very often such teamwork is the best way forward.